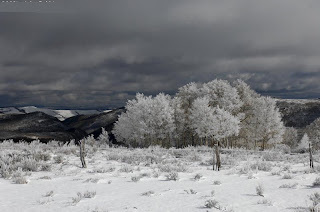 We are getting our first major snowstorm of the winter in Sanpete County. I expect it will warm up intermittently, and melt off before too long, but the long cold winter has unmistakenly begun. The land takes on a different character, covered with a blanket of new snow. It often reminds me of the kind of renewal we get from repentance. We are cleansed and become new again, in a process that invigorates and enlivens the soul. We can start from this point with a clean record, every thing old and dirty is gone. Covered over by the fresh clean blanket of new snow. As one who has felt as red as scarlet, I know how it feels to also become as snow. It is the true joy of the atonement. I miss the snow terribly!